A sustainable company is one whose purpose and actions are equally grounded in financial, environmental and social concerns. But unfortunately, the road to sustainability for most businesses is not that easy. Both staying competitive and making a difference for future generations depend on fostering a green mindset and putting it into practice. All action begins with admitting a need. To start making sustainability a business practice in your organization, you first need to identify the need for it.This means making a proud and deep commitment to sustainability as one of your core values. Talk about this value with your team and get approval from each member. Then you can begin to view all your business decisions through this lens.This perspective shift is financially costless, and it will allow your employees to connect the work they do with its effect on the planet. Gradually adopting more sustainable printing and packaging options is an easy, low-cost way to make a huge dent in your carbon footprint.First, you could aim to make your office paperless within the next few years. Use recycled content in your packaging whenever possible, or commit to printers that use chemical-free inks. These are small actions that reduce waste and add up over time to make a big impact. If you're in a co-working space or a building with other companies, talk to your neighbors about what you can do together to become more sustainable.Could you set up a common recycling center or collection area? Could you share printing resources or start a ride-sharing program? Solicit other ideas from employees and those around you to turn sustainability into creative business practice.Creating relationships that check your accountability can have a profoundly positive effect on your business while also helping the planet. As a small business, you may not be able to drastically change your community's architecture. You live and work where you can afford to, right? 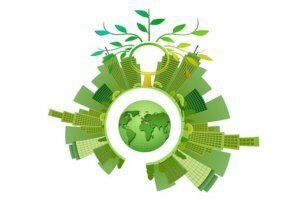 But as you grow and build out the spaces of your business, consider incorporating green energy and technology. Alternately, if you are renting space, push the building's owners toward adopting these solutions.Start small: Reduce the amount of hardscaping around your business and add grass-filled permeable pavers instead. When you're resurfacing your parking lot or driveway, ask your contractor to use only sustainable, recycled or porous materials.Afterward, you can incorporate other technologies into your business. Green roofs and insulation, low-water toilets, and heating and cooling systems aligned with the natural patterns of the sun are all viable options. To attract and harness the power of young people, businesses should consider offering a more sustainable workplace. Offer remote or flexible work policies if you can. This cuts down on overhead and transport needs.But beware of cutting corners to appear sustainable or merely selling the idea of sustainability. Millennials are acutely attuned to authenticity, and they'll be a strong team player only if your motives are genuine.Being green is good for business at large. It speaks loudly to customers about you and your values, demonstrating that beyond profit, you care about the world we all share.When you're a small business, everything you do is especially visible and important. If your parking lot is made from recycled plastic, if you serve locally sourced food, or if your office lights are solar-powered, customers will see that you're forward-thinking and engaged in the mission to end climate change.